Yup. Here we go again. 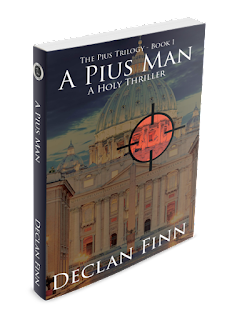 I've done Chapter 1 and was chapter 2, and now we continue with your look at the new edition of chapter 3 for A Pius Man: A Holy Thriller. By now, you're probably well aware my yanking this from the shelves when I signed with Silver Empire Publishing. But right now, it's back, and up for preorder, here, direct from the publisher, currently being sold with deep discounts. You can buy them cheap when you can. Because this deal will only last until July 1. So, hurry. And if you're new here, and have no idea what A Pius Man is ... It ate up ten years of my life, and the best use I have ever gotten out of my Masters in History outside of writing biographies of older vampires. But here you go, here's the next chapter. When you're hooked, order it. Or preorder it. Or something. You have pretty much ONLY UNTIL FRIDAY to order it at deep discounts from the publisher. So you might want to get on that. Today's chapter introduces a man from down the street -- or from across the Med, if you'll pardon the expression. The Pope has got a tour planned to go to Egypt, and they need to coordinate security. For the record, no, this will not have a critique of Pope Francis and his security measures -- or lack thereof--for his trip to Egypt. Not intentionally. Remember, the first draft is from 2004. I hadn't even heard of Pope Francis until he was elected Pope. Anyway, there will be more to come on A Pius Man. You have been warned. Hashim Abasi was tall and powerfully built, his broad shoulders accentuated by the fit of his sandy, tan jacket. At thirty-five, he had enjoyed a moderate professional success—given where he lived and what he did, being alive counted as success. He occasionally wondered how long that success would last since he couldn’t leave his job if he tried. Everyone in political circles liked him, mainly because he was one of the few not trying to stab anyone in the back. He ran a hand over his bald scalp, wondering what had become of his liaison with the chief of Vatican security. He was tempted to slide his reading glasses onto his sharp, angular nose and start flipping through papers on Figlia’s desk. Premature presbyopia annoyed him no end: others only needed reading glasses after forty or forty-five. He was just lucky in his ancestors that his good distance vision had saved his life more than once. Abasi pinched his sinuses, fighting off the coming headache. He crossed his legs, hoping to become even slightly comfortable in the office chair. If I ran the office, I would have chairs that made people uncomfortable on purpose. But who knows—the head of the papal detail may be a man chosen because of his virtue, and not because of his security qualities. “Agent Abasi, my apologies, sir, I had a little car accident on the way here,” someone said in English as he dashed into the office. 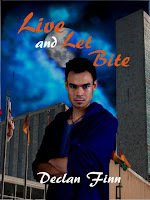 Abasi didn’t even stand, merely glanced at the head of papal security as he rushed through the door. Figlia’s cheeks were flushed, as if he had run the entire way. Abasi looked over Figlia’s suit, and wondered just how much Figlia dressed in basic black because he blended in, and how much it was affected by being on a SWAT team for so long. “Nothing serious, I hope,” Abasi replied in clear, crisp Cambridge English. It was a voice at odds with his body – most people didn’t expect a voice that educated to come out of a man with physique like a body builder. Then again, Abasi usually tried to stick to gutter vocabulary when he was on the job, it helped with the image. Figlia smiled, glad that they had English in common—the wonders of the “new Latin,” as the resentful Vaticanos called it. Although that is a good question—were they referring to English as a universal language, or the 2003 Latin dictionary, which had entries for “motorcycle” and “hot dog”? Abasi started, and turned towards the source of the new voice. Abasi arched his eyebrows. “Really?” He angled himself towards her. He ran a hand over his bald scalp, and scratched at the back of his neck. “Well, Agent Goldberg, there is something American Catholics don’t have to worry about—retribution should the Pope get killed. You may remember the uproar your president caused when he talked of a crusade against terrorism? For my people, the Crusades are as recent as fifty years ago. Everyone acts as though they’ve been personally traumatized by them, and that a new crusade could happen again at any moment.” He held up a hand to hold off her protests. “The idea is absurd, but that’s what they believe—if a Muslim should kill Pope Pius XIII’, my people believe the West will start their invasion in Morocco and go east.” Abasi looked to Figlia, then back to Goldberg. “Now, everyone in this room knows that, if a crusade should start, it will have nothing to do with religion and everything to do with killing religious psychopaths. His massive shoulders went up and down in a shrug. “In short, I am here because Egypt does not wish to be wiped out in the crossfire between tribes.” Abasi shifted again, failing to get comfortable. Like most of his predecessors, Pius XIII was on a mission from God. Goldberg arched a brow. I don’t think I’ve ever heard of someone say Darfur like he had a personal grudge. Then again, if I saw a genocide go on for decades, but no one paid attention, I guess I’d be pissed too. Even Abasi laughed at this. “You are not kidding.” He said to Goldberg, “I recall Kutjok’s first desire being to canonize ‘anti-Semitic’ Popes, Pius IX and XI--one had sheltered and supported Jews, and the other had condemned fascists and communists in the same week. It was announced by a new Secretary of State, a Vietnamese priest who spent years jailed by the People’s Republic of China … that was well-done.” Abasi smiled, obviously appreciative of the political chess involved. Abasi gave her a blank look; he had missed that one, apparently. “He was a full-time doctor and a sometime spy for the U.S. government in Vietnam,” Goldberg answered. Abasi smiled. Figlia was a man whose posture said cop. Sean, the mercenary, had changed out of his jogging suit only a few minutes after Giovanni Figlia had begun his conversation with Hashim Abasi. Already, he was about to begin the job he was brought here to do. For several weeks, he had been training men and women into what he saw as a well-equipped fighting force, even if no one else noticed. He double-checked his box of weapons to make sure that everything was there. It didn’t look like much, but he could make an entire army out of what he had there. He had been doing just that. He hitched his gear up and started out into the Borgia Gardens. When he had first been assigned that spot, he had found it amusing. Sean whipped out his tactical baton and opened it with a flick of his wrist. Now it’s time to make the Borgias look like amateurs, he thought with a manic smile on his face as he stepped out to see his trainees; the priests and nuns of the Vatican. If people thought that the Templars were fun to deal with, he thought, just wait until the conspiracy theorists get a hold of what I’m doing. They’ll go insane. The standard trend for Popes went one of two ways: nobles or peasants. In an age where nobles were disappearing, the noble was usually replaced with the academic. It had worked well in the case of Karol Wojtyla, and Joseph Ratzinger – John Paul II and his successor – who were both academics. Then there was Joshua Kutjok, the latest Pope. He was both an academic and a peasant. He had been educated by the Church, but had also lived in some of the worst places on the planet earth. And now he was the most powerful religious leader on the planet. He didn’t mind being “the most powerful religious leader on the planet,” but he did mind being called that to his face. It usually got in the way of getting things done. Pope Pius XIII was a tall, athletic, dark-skinned man. He was a very solid six feet tall and two hundred and thirty-five pounds, his hair salt-and-pepper gray, his eyes dark brown. He had a shoulder span as wide as the seminary bed he kept in his papal offices. His size made him intimidating, but his build made everyone exceedingly curious about how he moved over marble floors without sound. That wouldn’t have been so crazy-making had anyone had an idea about exactly when he slept: it couldn’t have been more than five hours a night. Pius XIII was either awake or at prayer at any time of the day, according to everyone who saw him at such hours, moving soundlessly through the hallways at three in the morning toward his office, or moving down to the office of papal security. Even though the offices of papal security were in a completely different building, he wanted the Commandatore on hand—no one was quite sure if he was just being prudent after the repeated attempts on his predecessor, or if this was a habit carried over from his former diocese. It was rumored back during the last papal conclave that he had once beaten a man who had threatened a parishioner. The rumors were never verified. A priest walked into il Papa’s office in a building next to the colonnade. He was a man with short, gray hair, a strong Roman nose, and brown eyes that twinkled with the anarchy so common among the residents of the Mediterranean, descended from the Roman mobs that ran the city into the ground over a thousand years. So, have enough fun yet? Just click here, and you can order it for insane discounts from the publisher.